For June, my goal is to have this baby! He absolutely must make his way out by the end of the month (fingers crossed for by the end of the week!) Since I know that I need to have some little quilting/stitching project in the works, too, I’m also going to make another small goal: to finish piecing the top of the English Paper Pieced table runner I started last summer. While going through my mental list of old works in progress I could dig out and make a bit of progress on while waiting for this baby, I mentally stumbled upon my Sweet as Honey EPP table runner. I realized that the color scheme is exactly the same as my newly started summer placemats, and decided it would be the perfect handwork project to add to my active to-do pile. When I last left off on this EPP project, I was planning on making the next row of honeycombs either orange or yellow. In looking at the bundle of fabric for my placemats next to the project, I am going to take a design turn and make the next row of honeycombs for the center Lucy Boston block (the one shown on the right, below) in the dark blue. 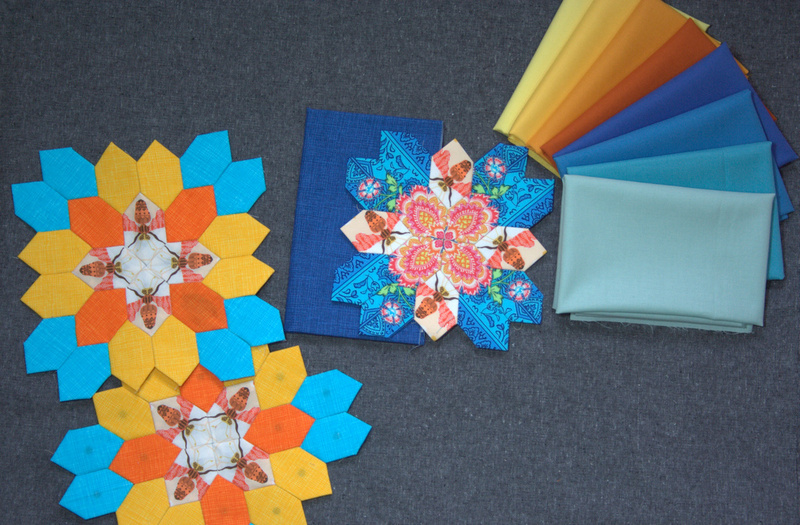 Then, I plan on making a bunch of 1″ squares (or maybe more honeycombs?) 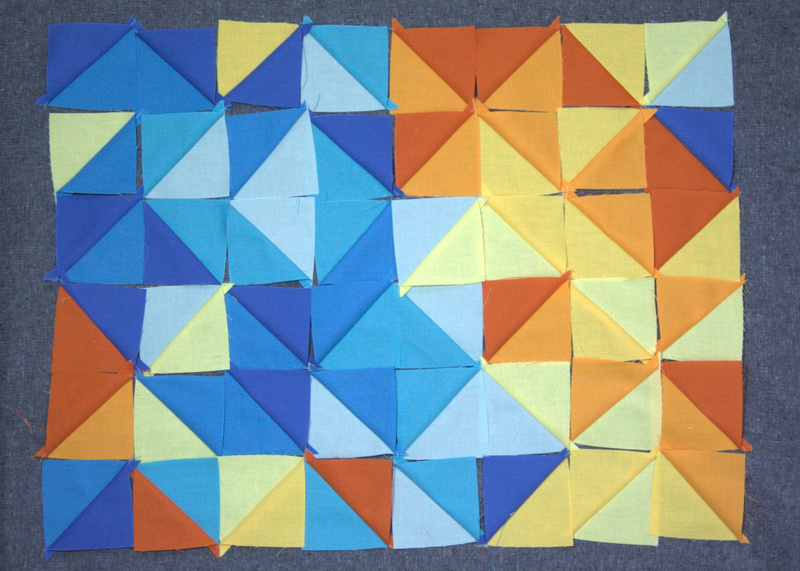 with which to border each of the blocks before joining them together in a row and binding. I’m planning to buy a little extra yardage of one of the Moda Bella Solids from the August bundle from Fiddlehead Artisan Supply to complete the border squares, and am leaning toward option 2 above: the medium blue. I’m excited and think that this table runner will go really well with my pixelated summer placemats. This is only a rough visualization of a placemat, but I’m excited at the potential outcome. It looks like even with only 8 colors, the aesthetic works for me. I love that each placemat will be different, and I am looking forward to playing around with color placement. 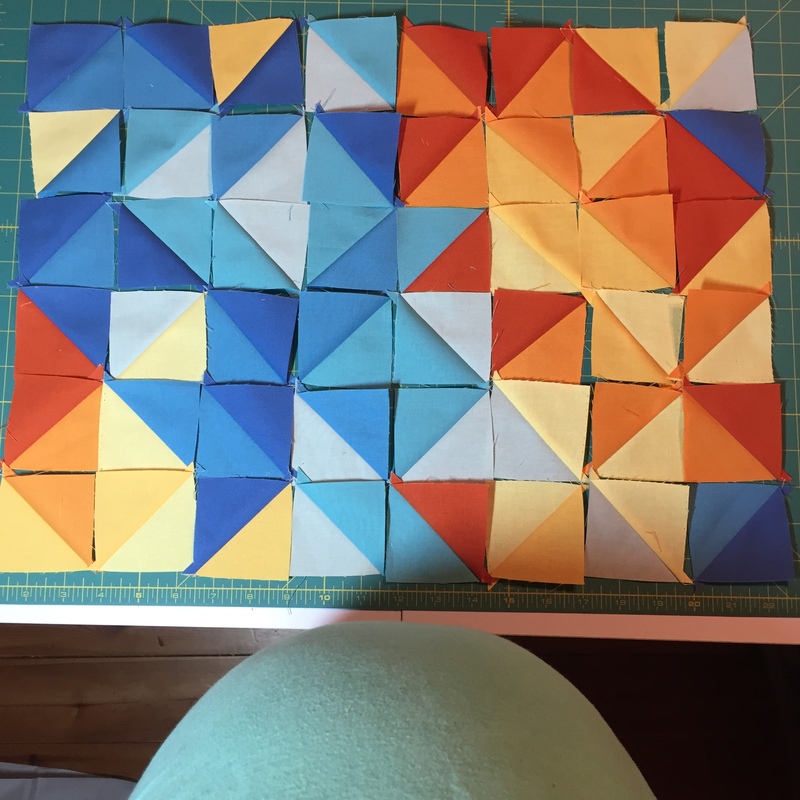 For this progress shot, the half square triangles (HST) aren’t squared up or sewn together yet, and I may make a bunch more and play around with layouts before sewing them together. According to my initial math, I will be able to make a set of six (6) placemats with my bundle of 8 FQs. I may buy another bundle just to be safe. I’m linking up with the June Goal Making party for A Lovely Year of Finishes, with a goal of having a baby (and maybe finishing the EPP piecing for the table runner top as icing on the cake). I’m also linking up with Monday Makers & Design Wall. 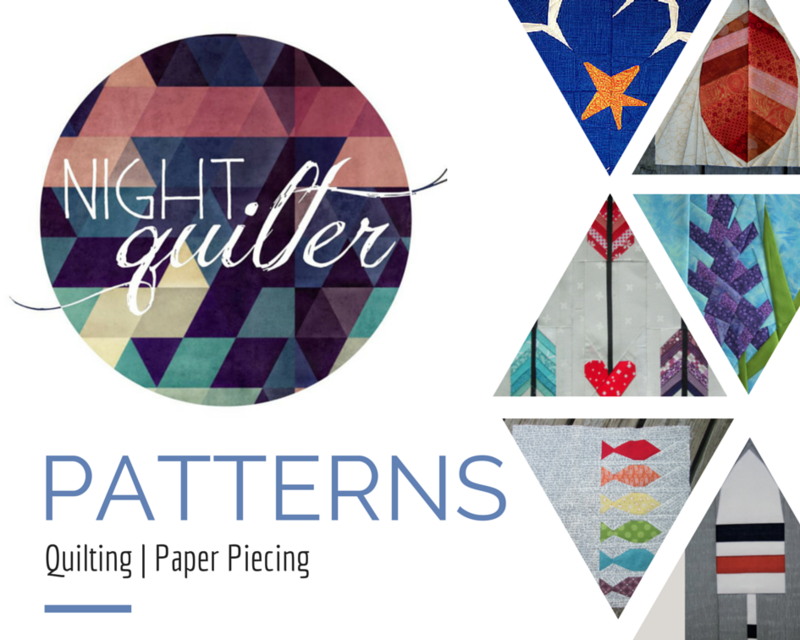 For those of you who want to get your hands on an August bundle like the one I’m using for the placemats, use coupon code nightquilter15% to get 15% off your entire order from Fiddlehead Artisan Supply‘s online shop from now through June 21st. Thank you for supporting my sponsors! Love that baby tummy in the photo Kitty! How fun that the Sweet as Honey blocks look so perfect with your pixelated placemats! I am working with the same colors of fabric for a quilt now too. It must be speaking to us of summertime. My first baby stayed put for 42 1/2 weeks, so I sympathize with you. We even went for car rides down bumpy country roads to try and get labor started. I keep thinking about you and saying prayers for you and the baby. Wishing you the best birth experience and much joy when you bring your little guy home! Love those colors! Good luck with the baby, may you have a happy and healthy little one. Medium blue! The dark orange is too dull for the rest of these colours. Good luck in labour. I love these colors. And your fussy cutting is so cool. I remember when you were working on these last summer at the beach. Those pictures were gorgeous too. I can’t believe its been a year already! Wow, a year already?!?! Where has the time gone? 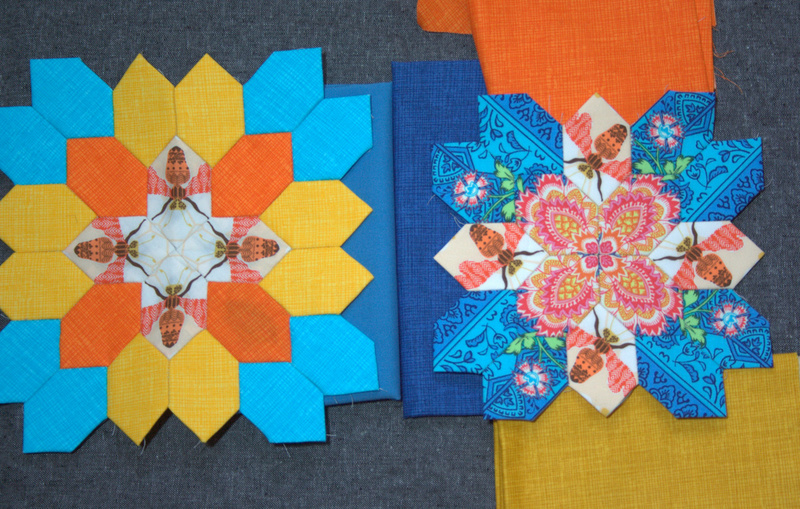 I love these EPP blocks. Something about the colors you’ve selected makes me feel alive. I’m definitely using this as inspiration on my next quilt. I too much prefer the medium blue to the burnt orange. It makes the whole project pop and is a better contrast. I’ll take the mommy tummy shots to feet shots any day… what a great June “goal”! Our number two was late, and it was the hardest thing in the world for me! In Germany they don’t cross fingers, but they press the thumbs… pressing thumbs for you and the little guy! I am quite confident you will meet your June goal! Hopefully sooner rather than later. Cannot wait to meet your little guy. I love your belly pic! I was too shy of being so big to take any pics and now I really regret it. Your placemats are coming along beautifully and the table runner will be a great complement to them. Fingers crossed for all your June goals! Medium blue is perfect. Love how the placemats and runner go together. And, yes, the belly is adorable! Good luck with the finish – well, both to them! I meant both OF them!